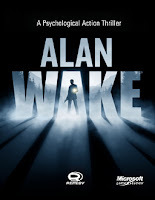 Alan Wake always seemed like an interesting game to me but it was never a game I ended up getting since I lost interest and kind of forgot about it since at the time I did not have an Xbox and had no plans to get one. I do have an Xbox now and it is most certainly my primary console so when I went to pre-order Borderlands 2 and saw Alan Wake for 11.99 pre-owned I decided I would get it and give it a shot. I have not yet completed Alan Wake (only in episode two) so there may be more examples later in the game that I have not yet seen. One of the things that has struck me about Alan Wake so far is the amount of product placement that is in the game. I am not complaining about the product placement AT ALL, I am actually quite pleased about the product placement present in Alan Wake because it is a game set in the real world. Alan Wake is set in America not some fictional Earth/America so why shouldn't it have real products? Games strive to be as accurate and immersible as possible but one thing that is always left on the wayside is brands. I'm not saying that a game set in the real world is a failure if it has brands but if something is a big part of a game then branding would not hurt. Alan Wake is a thriller, the more immersed into the world of Alan Wake you become then the more you will get into the game and enjoy it. The flashlight and all the batteries in the game are branded as Energizer (apparently they are not in the DLC). This is my favorite piece of product placement in the game since the flashlight is such a huge part of the game that it feels a great deal more real knowing you have an Energizer torch and a pocket full of Energizer batteries. The dashboard screen of Alan's car at the start of the game has something called Microsoft Sync on it. I could take or leave this since it makes no difference to the game and is really just advertising by Microsoft but it still gives the world a much more realistic feel. Alan's phone has a Verizon logo plastered on the front of it which is a nice touch of realism and also proves that even in games carrier logos plastered on a phone look ugly. I am not saying games set in the real world must have product placement to be good or realistic but when done right product placement can really enhance the realism.